Note: The contents of this post are intended to be introductory and does not include use of any libraries like jQuery. We can access the page contents through the Document Object Model (DOM). 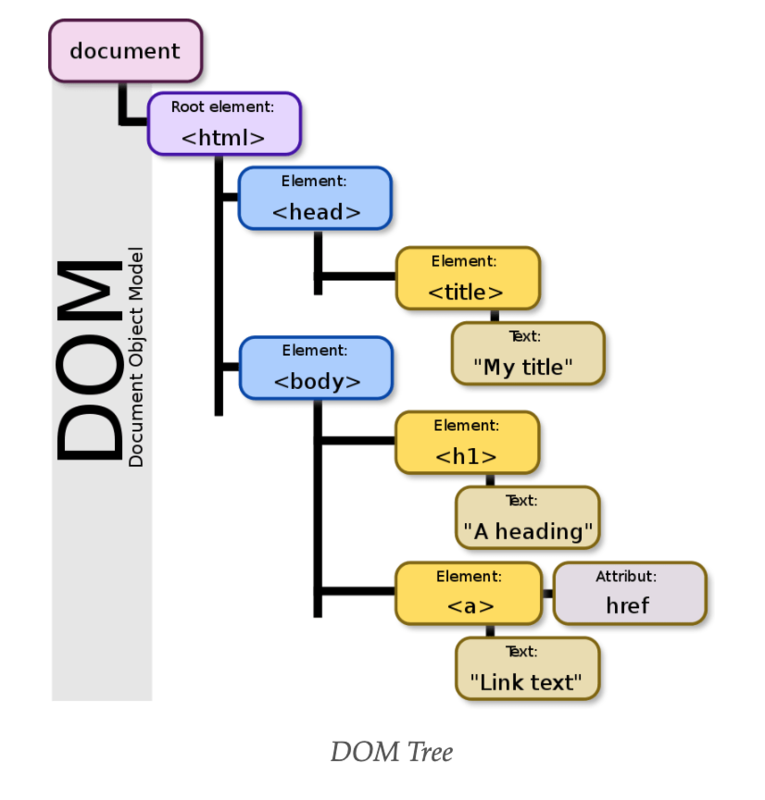 The DOM represents the page as a document in the form of a tree. This tree is made up of nodes which are just objects representing HTML tags such as div (referred to as elements) or just text. These objects have many properties and methods we can use for manipulation. In our code, we can use console.dir() in order to interact with the object and instead of its literal HTML you get from console.log(). Let's take a look at some of the useful properties and methods. element.children returns an array-like object of the element nodes nested under this element. 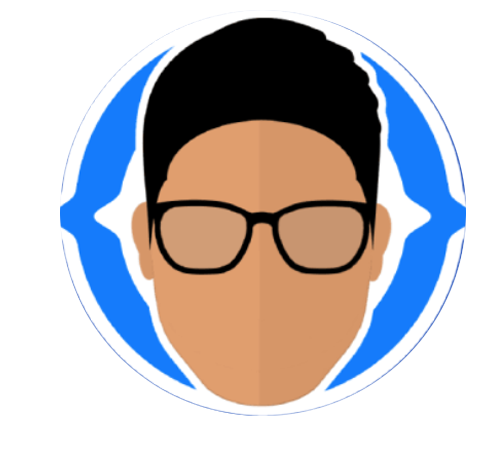 element.childNodes returns an array-like object and includes any nodes including text that is not wrapped in HTML tags. So which do you use? Generally you would probably use element.childrenmore as you only want to manipulate elements. However, whenever you need to access content that is not a node element (not wrapped in an HTML tag) then you would use element.childNodes. Keep in mind that any nested node will also have a parent node! element.textContent returns all the text content in the element. This is preferred over element.innerText which returns only visible text and would exclude text hidden by css. This is where using element.childNodes would come in handy, since we can access just the text without changing the other child nodes. //   - textContent: "Just text"
//   - textContent: "Text in a p tag"
element.id can be set to directly to change the id of the element. element.classList returns an array-like object that can be added to with element.classList.add("hidden") or removed from with element.classList.remove("hidden"). You can also generally modify any attributes (including the above). Events can be attached to elements (the EventTarget) via addEventListener() by listening for certain events and calling a callback function when the event is fired. The callback functions will pass in an event parameter for that event with a lot of specific properties for the events. All of the event objects have a target property, which will give you the element on which the event was fired. It will be very useful to have this object reference since you can then access its methods and properties discussed above. There are LOTS of DOM events but I'll just go over the basic ones (excluding deprecated events) used for creating interactive UI. 'keydown' is fired when any key is pressed. 'keyup' is fired when any key is released. You can check to see if the user pressed or released a specific key by comparing the keycode value. It is recommended to use e.keyCode since e.code can vary across browers. Keycode.info is a great resource for quickly getting keycodes. 'click' is fired when the element has been clicked (pressed & released). 'mouseover' is fired when the element is moved over the element. 'submit' is fired when the form is submitted by pressing the submit button or pressing enter on a form input. 'change' is fired when the value of an input element (input, select, textarea) is changed. It is important to note that when a form is submitted, the corresponding action will attempt a page redirect, which will trigger a page refresh. To prevent this, you must add e.preventDefault() to suppress the default behavior. Let's talk a bit more about e.preventDefault(). We know it can be used on the 'submit' event to prevent the default page redirect behavior. What about other behaviors? If we wanted to listen for Arrow Key inputs, the 'up' and 'down' arrow keys will cause the page to scroll (if any). This is another example of where we can use e.preventDefault() to suppress the default behavior. It is applicable to many different elements, and can be used whenever we want more control over events. Other examples can be found here. We can use the various attributes and types of HTML elements to grab the ones we need. Here are some of the widely used as well as recommended methods I gathered from my research. document.getElementById is the way to grab a very specific element. It will of course require an id on the element which must be unique. Assigning ids to elements should be done judiciously. document.getElementsByClassName() returns an array-like object of all elements with the given class name. getElementsByTagName() returns an array-like object of all elements of the given HTML tag. document.querySelector() is another way to get a single element by query. It will grab the first element that matches the query. document.querySelectorAll() functions the same way as querySelector() but returns all elements that matches the query. 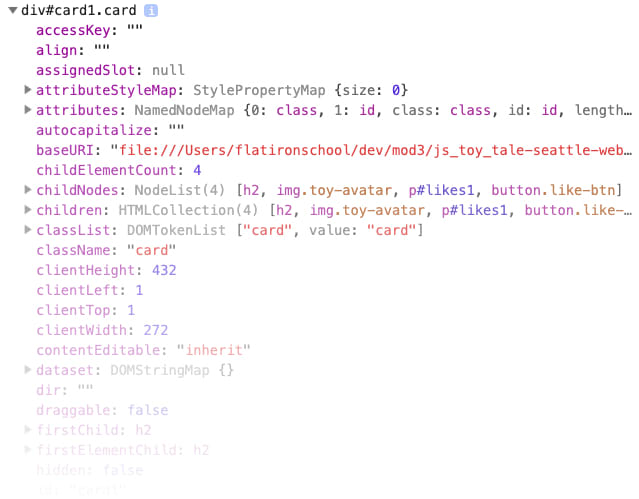 You can grab an element by id 'example by #example or the first element of a class "card" by .card. You can specify multiple queries with the comma to signify an OR.document.querySelector('.card, div') will grab the first element that has a class "card" or the div tag. You can use CSS selectors for the query. We could get the inputs inside a form by iterating its children, but what if we wanted to know exactly which input to get instead of keeping track of the indices? A form element has a property elements which is an array-like but also an associative array-like object that allows us to get the form inputs by name. We can create new elements with document.createElement() and specifying the tag name, for example, a div. But once we create a new element, where does it exist? In order to actually display our newly created element, we must append it to the DOM somewhere. Typically we will grab a parent node and append it to that parent. Say for example, we have a div container and we want to add a list to it. // This would not display the list to the DOM since our <ul> is still not included in the DOM! // Now the list will be displayed since we have appended it to an element in the DOM. If we want to render something different that involves more changes than a simple text change (for example, a UI with tabs and displaying different content on tab change), then we need to do some kind of a "re-render". Since we are doing appendChild operations, we would end up appending the different content on top of the previous content. So how do we make sure we render changes the right way? We can remove the "old" elements and then append the new ones. After you are comfortable with vanilla JS, if you are looking for ways to refactor or write more powerful code, you may be interested in looking at a popular library called jQuery or modern front-end frameworks like React. Special thanks to our guest blogger Brian Pak, for his contribution to the Ronald James Blog this week.